Home / News / Business / Make Macc more sustainable! 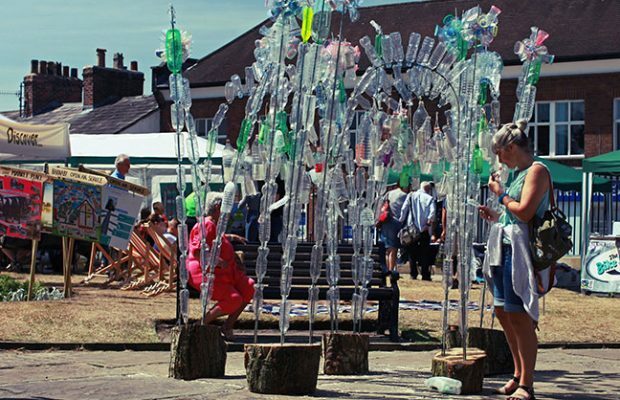 Hundreds of pledges were made to help the environment at “Macc-tastic, Less Plastic” held during Barnaby Festival in June. The bonanza of ideas on how to ditch single-use plastic was triggered by the BBC’s Blue Planet about the devastating impact of plastics in the oceans. Now there’s a move to build on that momentum and start a new eco movement in Macclesfield, with a free event at St Michael’s Church, Market Place at 7.30pm on Tuesday 25 September, ‘Make Macc More Sustainable’. Topics could range from tackling vehicle fumes, reducing litter, creating a tool-sharing ‘library’ to saving bees – but reducing single-use plastic is bound to be high on the list. The guiding principle of reduce, reuse and recycle is already being adopted by individual retailers, businesses and organizations around the town. 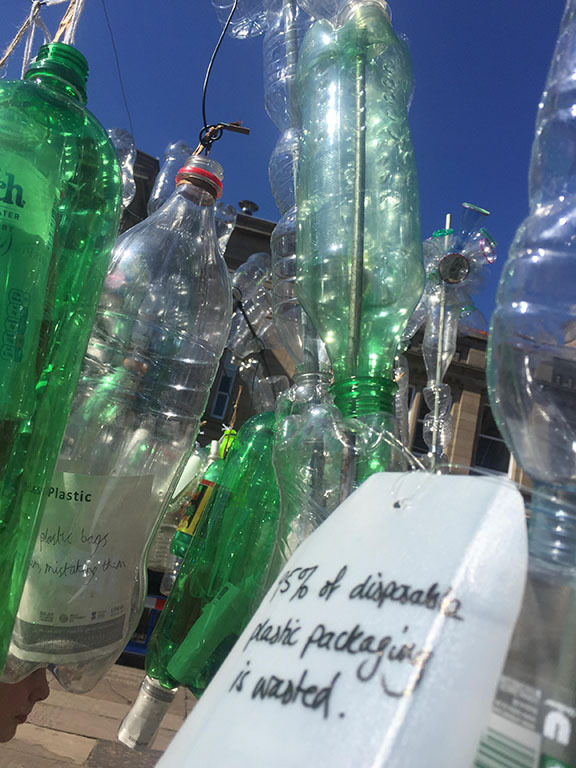 The monthly Treacle Market has been working to drive out single-use plastic on its stalls. Co-organiser, Jane Munro who was a driving force behind ‘Macc-tastic, Less Plastic’ said “We’ve challenged our traders and many of them have come up trumps. An increasing number will take back food containers including Fruits of the Forage, Smart Coffee and Waanyen Thai Food, others like Oxeye Daisy have switched to biodegradable packaging. Poodle Retro have banished bubble wrap and gone back to using old newspaper! 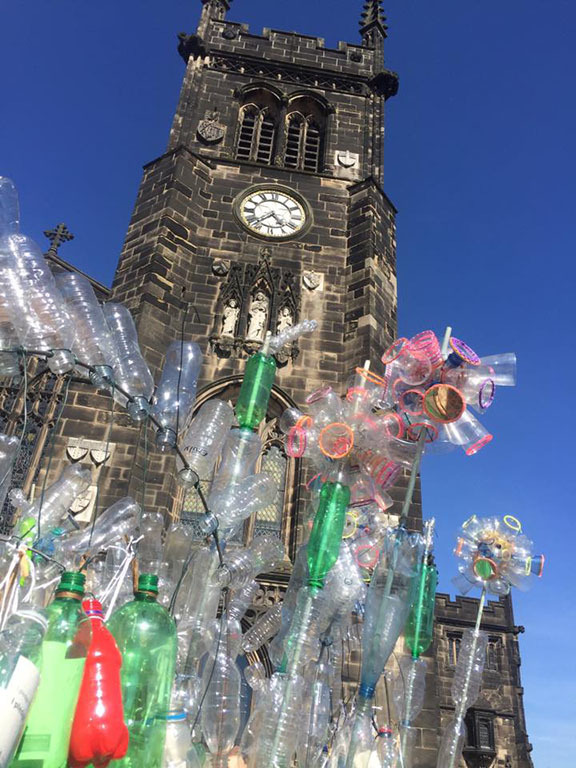 “We ask visitors to do their bit by bringing their own shopping basket, reusable coffee cup or tupperware- type container and visitors can always refill water bottles at St Michael’s Church”. A group of pupils at Tytherington School recently set up ‘Tythy Goes Green’ which is working with the headteacher and their catering supplier to remove all single-use plastics by next year. Esther Bird and other Year 7 campaigners gave a talk at Barnaby Festival’s ‘Macc-tastic, Less Plastic’ and explained how they’ve already scrapped plastic straws, cutlery and polystyrene takeaway boxes. A new website about plastic NotJustOnce.org is targeted at Maxonians and is packed full of information, tips and resources about hot to take action now. It’s creator, Colin Townend is Chair of volunteer group Food 4 Macc which has been going since 2011 and runs various eco projects including community gardens to share skills and grow fruit and veg on underused patches of land. Organisers of ‘Make Macc More Sustainable’ hope the meeting on 25thSeptember will lead to the creation of a new network or group and become another legacy project of Barnaby Festival which has been the catalyst for several successful spin-off initiatives. Macclesfield Town Council are supporting the event and welcome input into the sustainability policy they are developing. St Michael’s Church on Market Place will open its doors at 7pm on Tuesday 25thSeptember, with hot and cold drinks available before a prompt start at 7.30pm. All are welcome, register in advance online at Eventbrite.co.uk or just turn up! ← Previous Story Get set for Pride this Sunday!